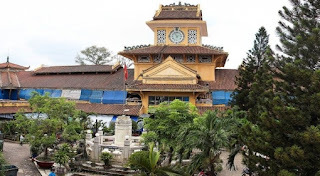 The construction of Binh Tay Market was greatly supported by Quach Dam (1863 – 1927), a Chinese businessman. He was also well-known under the trade name of Thong Hiep when operated his own businesses. Quach Dam was famous by his nickname “the Handicapped Thong” by the local Chinese. Starting making business with recycling garbage and other used material, Quach Dam was a poor man. However, he later striked gold and gained his enormous fortune by picking up other types of businesses. Used to place in the center of Binh Tay Market, the statue of Thong Hiep was made of bronze and has the human size. Under where the statue was placed, there were four bronze lions, and four bronze dragons spitting water to the fountain. The full size statue of Thông was replaced with a smaller glass-altar somewhere between 1976 and 1980, with reasons unknown, although some local people speculated that the statue itself was being recycled. The four bronze lions and dragons are still standing as of 2002.